(Newser) – Traveling with dogs may be more dangerous than you thought. Two recently died on United Airlines flights, highlighting the danger of flying with pets—and the apparent lack of responsibility taken by the airline, NBC News reports. 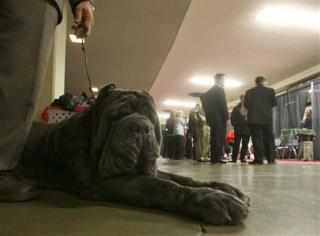 Michael Jarboe's 2-year-old Neopolitan Mastiff, Barn Barn, died last month while flying from Miami to San Francisco. "What I found out is, when you check your pet, you run the exact same risk of them not showing up as you do with your luggage," Jarboe says. "That's kind of sobering." I stopped flying my 100 lb dog when I found him at the baggage claim and his large kennel was upside down. Obviously the baggage handlers were having some "fun" with him. Never again! Airlines (Delta) usually have pretty strict rules on when (what months/temperatures) you can ship dogs... at least in my experience. I shipped my dog internationally. The biggest problem I saw was in the Airport Atlanta Hearts-field International. I bought a large cage for my puppy because he was going to be growing and didn't want any risk on the trip back of him being to big. Anyways I had to change flights several times got a hotel voucher then the hotel would only take small breed dogs. Anyways the thing that pissed me off the most was inside the airport they wouldn't let me see my dog unless I took him up and rechecked him the next day(fine by me) but more annoying was that it took me nearly 2-3 hours for them to get my dog to where I could see him and take him with me. Also they would not let me talk to anyone who was taking care of my dog (he was going to be checked in several hours earlier before the flight the next day.) The woman who I dealt with was so rude and unhelpful. I was contemplating filing a complaint but it didn't seem like she worked for the airline... she worked for the airport. This was the complete opposite of the KC airport where people there couldn't have been more helpful. They even offered to walk my dog... let my dog be out and about inside the airport (it was winter), they confirmed when my dog got on the plane, kept him in a climate controlled area until he got in and even though they couldn't get him on the plane they did the changes as fast as they could to get me on my way. In all big busy airports are where the problems are... My friend had his dog escape on the runway at a big airport they used a rubber bullet to get the dog to stop... this caused the dog to need his leg to be amputated. United is the absolute worst. Avoid them at all costs.